Juventus defender Mattia De Sciglio admits his side "wasted" a big opportunity against Tottenham as they let a 2-0 lead slip to draw 2-2 in Turin. 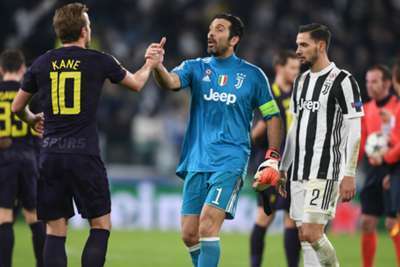 Gonzalo Higuain's double in the first nine minutes put Juve in control of the first leg of the Champions League last-16 tie, but goals from Harry Kane and Christian Eriksen gave the visitors a slight edge ahead of the return game at Wembley next month. Higuain also missed a penalty in the first half, but Spurs largely controlled the match after their nightmare opening, with Massimiliano Allegri's side managing just 33 per cent possession on home soil. And De Sciglio conceded the Serie A champions dropped far too deep once they had their two-goal lead. "We knew it was going to be a difficult game," he told Mediaset Premium. "Tottenham are very strong, especially in midfield and attack. "I think we made a mistake when we were 2-0 up. We started to defend too deep allowing them to have the ball easily in midfield. It's a pity because we wasted a very important lead, but I'm sure that we can win at Wembley. "We know it will be difficult again because we are facing strong opponents, but we must remain confident, especially after watching what we did in the first 10 minutes." Winger Federico Bernardeschi felt Juve deserved to win the match, despite their largely lacklustre display. "I think we played a great game against a very strong side, with the right grit and determination," he said. "We had a great start, but, after going 2-0 up, we did not manage to maintain the same tempo. "It's a pity because we had several chances to score and we deserved to win, but we remain confident ahead of the second leg. We know that we can win there [in London]."